From SELF DISCOVERY - personally researching to gain knowledge. YES/NO: Some vital information you have received from certain 'expert' Authorities in your life may NOT have been entirely accurate and true. YES/NO: Most cumulative knowledge that you have gained about the origin and nature of the universe, life, and humankind has NOT been gained through Self Discovery. That which you Know that you Know (K-K). 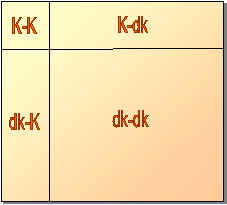 That which you Know that you Don't Know (K-dk). That which you Don't Know that you Know (dk-K). That which you Don't Know that you Don't Know (dK-dK). Is this Knowledge from AUTHORITIES? Is all Historical Knowledge from AUTHORTIES? What about spoken knowledge handed down through generations? Is this Knowledge from SELF DISCOVERY? Is Knowledge in Bible from an AUTHORITY?